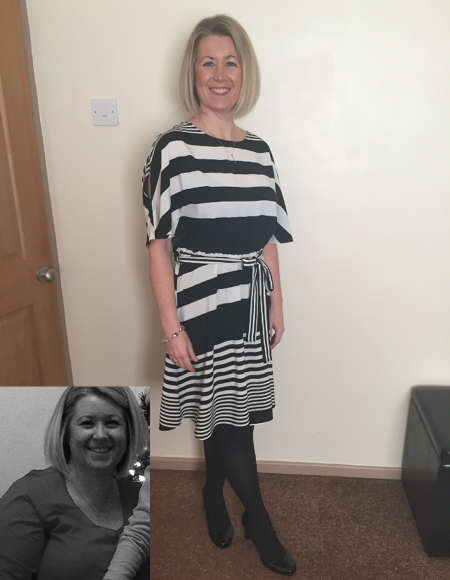 Since joining Nutracheck in April 2016, I have lost 5 stone70lbs31.7kg. What prompted your decision to lose weight and how did you hear about Nutracheck? I was sat in the garden on a particularly warm spring day; an old pair of shorts digging into my thighs and a vest top stretched across my tummy. My husband and six year old daughter had just booked a holiday to Florida for May 2017, with my sister-in-law, her husband & their two daughters. I remember looking down at myself and thinking - 'I need to do something. I can't possibly sit on an aeroplane for over 9 hours, I am going to be so uncomfortable'. The same day I was also wondering about my risk of developing diabetes. Whilst searching for information on the NHS Choices website, I came across a link for Nutracheck. I signed up for the 7 day free trial and was instantly hooked. My weight has been up & down over the past 20 years. I've lost several stones with both of the big slimming clubs but have never been able to sustain my loss once I reached my goal weight. I would go straight back to my old habits within a month of reaching goal and the weight would begin to creep back on. By following Nutracheck, I have had a steady weight loss of 1-2lbs each week. I even lost weight on a 2 weeks all-inclusive holiday and over the Christmas holidays. Nutracheck fits so easily into my lifestyle. We all eat the same meals, I just have smaller portions than I used to. I still enjoy crisps, wine & chocolate - now it's not the whole bar or box! I love the way it encourages you to drink 2 litres of fluid, eat your 5-a-day and participate in some form of exercise. The support on the forum is amazing, there's always someone there to cheer you on and congratulate you, or pick you up after a bad day. The barcode scanner is so easy to use, as is the 'favourites' section. The foods listed in the database are immense, it's difficult to find an item that isn't there. It really does only take 10 minutes a day. Now, I feel fantastic! I have more confidence, my skin is clearer & my back pain has gone. I enjoy my food so much more, I am in control of my portion sizes & I make better choices. I'm walking around 8,000 steps each day & will increase this further. I've gone from a snug size 18 to a comfortable size 12 and I'm choosing clothes that I wouldn't dare to look at this time last year. My BMI has reduced from an obese 36 to a healthy 24. I have lost 5 stone and my daughter weighs 4 stone, I struggle to pick her up. I can't believe I used to carry all that weight around with me on a daily basis. For anyone wanting to lose weight I would recommend the 7 day trial - give it a try, you'll soon be hooked. Be patient, the weight didn't go on overnight so it won't come off overnight. Eat less and move more, simple!